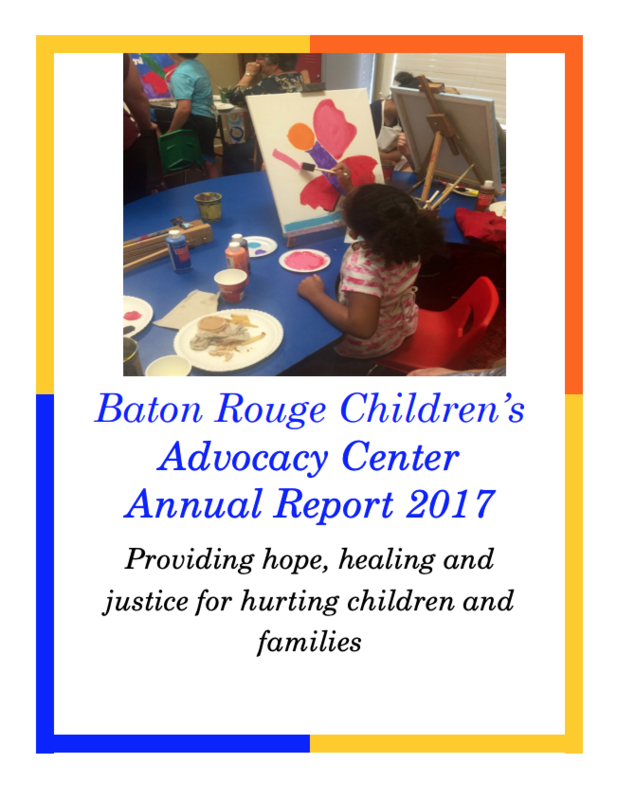 The Baton Rouge CAC opened its doors in 2002 after years of planning and collaboration by a group of concerned citizens representing many different disciplines. From there, and through widespread community support, the CAC has expanded to serve four parishes. The CAC’s location, often referred to visiting children as “The Yellow House,” has expanded and our program achieved accreditation by the National Children’s Alliance in 2014. As the sole agency providing immediate interventions for children exposed to traumatic events in the Capital Region, BRCAC serves the community’s most vulnerable children. The Center, a restored Victorian home, serves as a safe home-like atmosphere for traumatized children and their families to visit for all their recovery needs in the aftermath of traumatic events. And at the same time, the BRCAC serves as the location for professionals in the fields of law enforcement, child protective services, physical and mental health, education, prosecution and criminal justice to connect with children and their families. They may connect at the Center whether it’s for the purpose of fact-finding, coordinating the prosecution of crimes or to link families with additional services. We have positioned ourselves as a community leader when it comes to responding to youth impacted by trauma including active crises situations when youthful citizens are involved. is to set children on a solid path to healing and justice by providing trauma-informed, efficient and coordinated child-focused services in the aftermath of abuse and violent crime. BRCAC also provides community education and primary prevention by appearing in schools and other venues serving children, as well as engaging in the training of caregivers of children in understanding the dynamics of child trauma and supporting them in its aftermath. More recently we have expanded our capacity to provide community education to youth-serving providers in the fields of law enforcement, education, after-school programming, medical and mental health. The focus of this education is on the long-term impacts of childhood adversity (i.e. via the sciences of the ACES study) and trauma and how whole systems can become more trauma-informed in responding to youth and vulnerable populations who are at risk. The demand for this service increased drastically in 2016 when Baton Rouge faced historical and unprecedented community-wide trauma due to police-involved shootings and a natural flood disaster. The mantra of our trainings regardless of audience was that “trauma creates a ripple effect in communities. Whether it is historical or racial trauma or precipitated by sudden incidents of violent crime, what affects one affects us all. The solutions must be group and population or systemic-focused. Check out our annual report which provides a snapshot of our work and activities in 2017. Learn how many others have supported our mission and continue to help us grow. JOIN OUR AMAZING TEAM OF STAFF, INTERNS & VOLUNTEERS! We are always looking to grow our team. For more information on how to join BRCAC, contact us! Hear what children and their caregivers said about what they most appreciated about their experience at the Center. “I really enjoy the services. Mr. Gino is a very good person. I believe he can help my kids get through their trauma or get them talking. I encourage others to see him or come to the Child Advocacy Center.